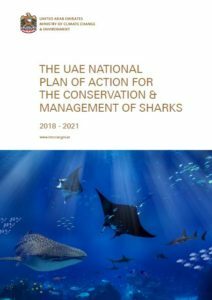 The Ministry of Climate Change and Environment (MOCCAE) has launched the National Plan of Action (NPOA) for the Conservation and Management of Sharks 2018-2021 that presents concrete steps to promote shark conservation and sustainability in the UAE. The Plan has four main objectives: enhancing knowledge of shark species and their role in the ecosystem among the population, implementing effective policy, legislation and enforcement mechanisms and developing a national, regional and global cooperation framework, enabling effective conservation through capacity building, and running educational and outreach programs to raise public awareness. The NPOA provides an overview of the current status of cartilaginous fish in the country with a special focus on sharks and rays. At present, there are 43 shark species and 29 ray species recorded in the UAE’s waters, with 42 percent of these considered endangered as per the International Union for Conservation of Nature (IUCN) Red List of Threatened Species. Furthermore, the Plan identifies the challenges that have led to a decline in shark stocks, most notably fishing (commercial and recreational), land- and sea-based pollution, coastal development, habitat alteration, and climate change. Shark populations in the country have witnessed a decline in recent years as a result of over-fishing, mainly due to the high value of their fins, meat, and gill plates. She outlined the indicators for measuring the effectiveness of the NPOA, such as community awareness about the importance of shark conservation, status of the shark population, improved management of marine protected areas, and the extinction risk faced by individual shark species. Coinciding with the launch of the Plan, MOCCAE issued the UAE Shark Assessment Report, the first national overview of shark research and protective measures in the UAE. The document offers a valuable database that will support the execution of the Plan. Following its four-year implementation (2018-2021) timeline, NPOA will undergo a consultative revision to enable an adaptive management approach, and ensure the attainment of its strategic objectives and overall vision. The Plan is available to the public on the Ministry’s website.